Easter is just around the corner and we have an “eggs-citing” activity that all family members will enjoy! For many families, the tradition of egg colouring has always been a part of Easter preparations. This year let’s try colouring eggs with natural dyes. Kids will love to see all the “eggs-traordinary” colours that they can produce using different vegetables and spices that you might have in the kitchen. Here are some recipes that will give you intense, beautiful colours and you don’t need to worry because the ingredients are natural and safe. We are sure that your kids will be “egg-static” about this activity! To help prevent the eggs from cracking, keep them out of the fridge for about 1 hour before boiling; also, put one (1) teaspoon of salt in the water during boiling. Before coloring, wash the eggs with soap and water; remove any oil or marks on the egg with rubbing alcohol to get better colors. Cover your table or work area with paper because some of the dyes might be intense and it’s not easy to wash them off your surface. 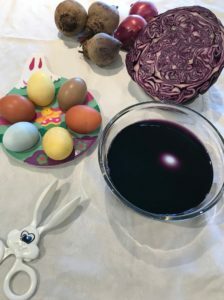 Use a cooking skimmer or slotted spoon to transfer the eggs in and out of the dye. If possible, pick a saucepan that is deep enough that your eggs are completely immersed in the dye or you will get a white/light spot; you can also roll them over occasionally to get an even colour. 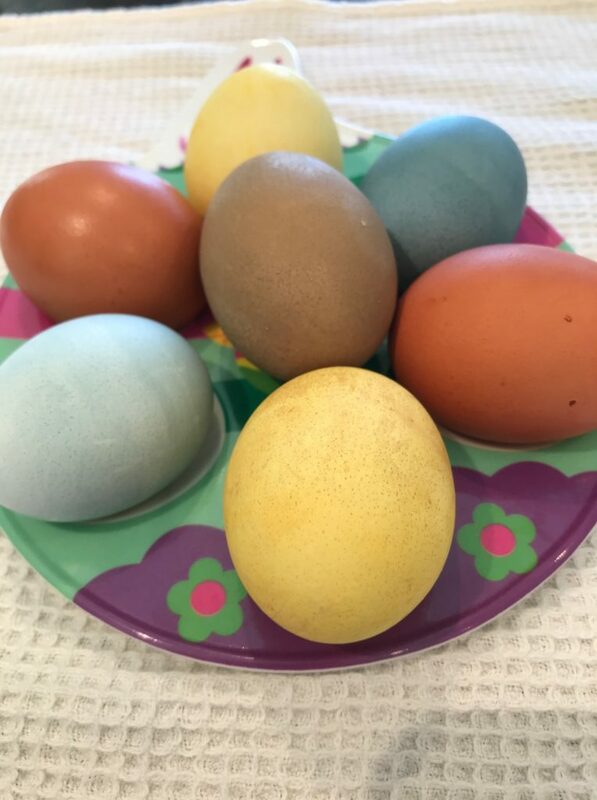 After coloring, dry the eggs out and wipe with olive or canola oil to give them an incredible shine. Colored eggs must be kept in the refrigerator. Now let’s get started! Here are our Top 5 Natural Dyes and instructions on how to colour your eggs. Have fun!! Take the eggs out of the dye using a slotted spoon or tongs; pat dry with paper towels and let dry completely on a rack. Take the eggs out of the dye, pat dry and then allow to dry completely on a rack. Take the eggs out of the dye, rinse and pat dry and then allow to dry completely on a rack. 5. Beautiful Blue Eggs – believe it or not Red Cabbage produces Blue dye – very Cool! Note: For this colour option, you will need to hard-boil your eggs in water for 10 minutes and let cool before dying. To get deeper blue colours, try leaving your egg in the dye overnight and see what happens! Take the egg out of the dye, pat dry and then allow to dry completely on a rack.